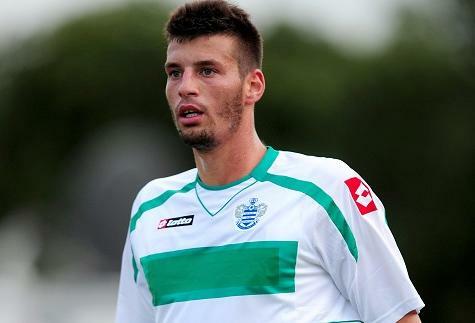 Bruno Perone will go down as one of QPR’s favourite ‘do you remember’ players when discussed in pubs years from now. The central defender came to Loftus Road in the summer of 2011 as Neil Warnock looked to recruit players for QPR’s forthcoming Premier League campaign, with the limited budget set for him by then owners Flavio Briatore and Bernie Ecclestone. By the time the transfer window ended however, Tony Fernandes had taken over the club and allowed Warnock to go on a wild last minute spending spree, leaving Perone’s one year deal ultimately redundant. He made two appearances for the R’s, a Carling Cup defeat to Rochdale and a 2-0 loss to Wigan where he actually hit the bar with header, before being released in June 2012. Briefly touted as a “mystery signing” for Nottingham Forest by former manager Sean O’Driscoll in October 2012, Perone has subsequently returned to Brazil where he plays for Serie B club Isaca. This entry was posted in The Samba Series and tagged ash rose, bruno perone, isaca, loftus road, qpr, samba series by The Samba Series. Bookmark the permalink.